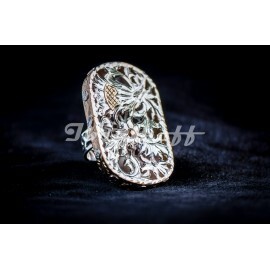 Silver ring ressembling intricate nobility seal; visually demanding, intensely crafted with minute care for every detail. 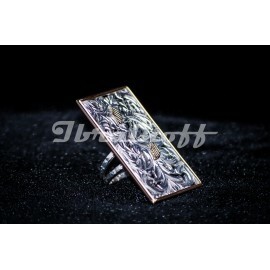 Always fashionable ring and still mastering fashion. 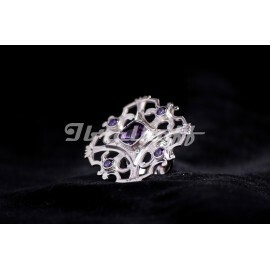 Its rectangular shape enc..
A literally royal jewel, magnificent with some fabulous design and flawless craftsmanship and a powerful feeling about it.A beautiful art piece, uniqhe, modern, imperial: it conveys power emotion and ..
Silver ring with amethyst featuring a truly architectural and baroque look, of inexhausible expressivity which combines the fluid element and rigurous geometry. Five ametist stone silver ring, handm..